Unfinished capriccio showing an elevation of six bays and two stories composed as alternating arches and columned screens, separated by giant semi-engaged columns and fluted pilasters with aedicular windows below a balustrade and pulvinated and decorated frieze. 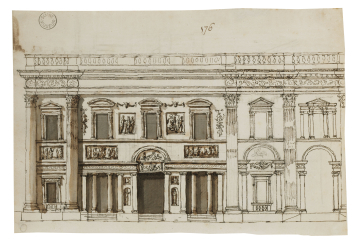 You are here: CollectionsOnline / Unfinished capriccio showing an elevation of six bays and two stories composed as alternating arches and columned screens, separated by giant semi-engaged columns and fluted pilasters with aedicular windows below a balustrade and pulvinated and decorated frieze. Capricci in pen and pencil showing four elevations; two of these show two-storey buildings of five and seven bays; two others are in outline form. The two pencil elevations can be combined to produce a scheme similar to that shown on the recto. The left elevation may be compared with the palace façade in Adam vol.4/70. Also on the sheet are two details of part of a plan, and a drawing of part of a tree. The finished part of this elevation may be a version of the scheme shown on the verso of Adam vol.55/134.